In which I try the new polymer.dart, a build.dart file is deleted, and a template springs to life. Developers take notice! Coming soon: actual encapsulation, real live data binding, even re-usable components! The Web Components family of specifications is on their way to a browser near you, but the standardizations process is lengthy. Fear not, web engineers are working hard to bring these new capabilities to you today. 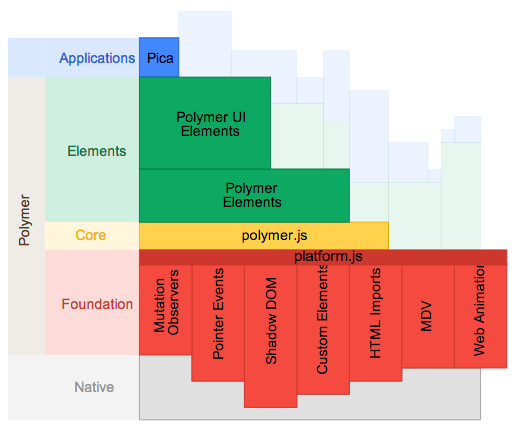 The Polymer project, a new type of library for the web, is built on top of Web Components, and designed to leverage the evolving web platform on modern browsers. Most importantly, the Polymer project has code that you can use today (to be fair, it's pre-alpha, but much of it works if you are brave). This could very well be my last Web UI post! The Dart team announced they started on polymer.dart, a port of the Polymer project to Dart. Polymer.dart is the next evolution of Web UI. Luckily, the concepts are mostly the same and the syntax is mostly the same, because Web UI is also an implementation of the Web Components. So why am I still writing about Web UI? Lots of people have asked about two-way data binding between a component and a model, so I wanted to have a record of this functionality. Also, what's described below isn't too different than how polymer.dart works (and we'll cover it in a future post). I look forward to the glorious new world of coordinated polyfills and new custom elements. Go go polymer.dart and the Polymer project! 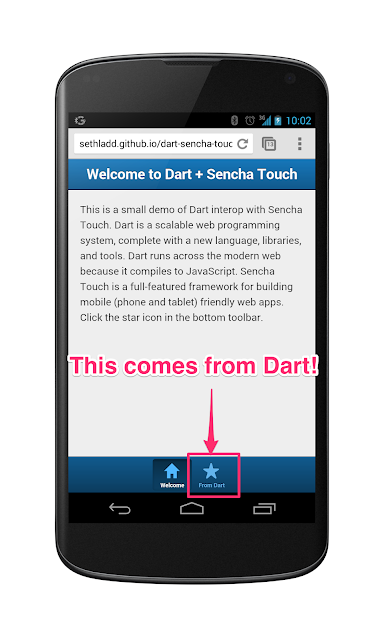 You can use Dart's JS-Interop to integrate Dart code into your existing Sencha Touch application. This allows you to take advantage of Sencha Touch's mobile-first framework and Dart's productivity, language, and libraries. I've never used Sencha Touch, so my first question was: how do I insert Dart into an existing Sencha Touch application?